« To Everything There is a Season: A book that gives us cause to weep from an author who’s best known for his laughs. Nothing But Blue Skies From Now On! After a chilly and rainy Memorial Day weekend, I think I can say (knock on wood) Iowa has fully and finally emerged this week from what felt like six straight months of gray overcast. If I hadn’t been born and raised here, if my parents and in-laws didn’t both live here, this winter and dismal spring would have been enough to send me packing for Arizona. I may just have to settle for a light therapy lamp next winter. Meanwhile, I’m soaking up every minute of our long-awaited summer. The brilliant blue skies and cotton-candy clouds look as though Monet painted them. And those cumulus beauties bring to mind childhood afternoons spent seeking out animal shapes in the sky. The ability to see such images in ordinary phenomena is referred to as pareidolia (think the Virgin Mary’s face in the grilled cheese sandwich). It’s a skill I’m having fun teaching my 3-year-old, Eloise. My nearly-30-year-old imagination is not quite as supple as it once was, but I was still able to spot a Scottish terrier and a snail the other afternoon. 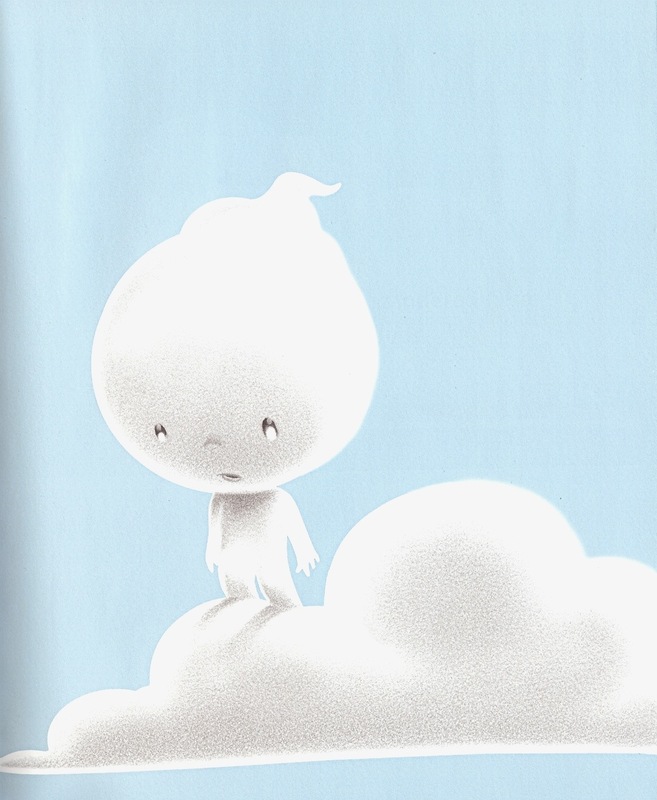 Thankfully, I also have Rhode Montijo’s “Cloud Boy” as a visual aid. The book, beautifully simple in both word and design, offers an imaginative explanation for how the clouds get their menagerie of shapes. In a gentle palette of sky blue and cloud white with shades of charcoal gray, Montijo conjures up a lonely little cloud boy, who lives high in the sky and longingly watches the fun of children playing on the earth below. His solitude is broken one day by a wandering butterfly, and the fleeting visit gives the cloud boy a wonderful idea. He gathers the fluff of a nearby cloud and fashions his very own butterfly. Inspired, he shapes the clouds around him into creations big and small – boats, turtles, swans, whales – and sends them off into the sky for the children below to see. 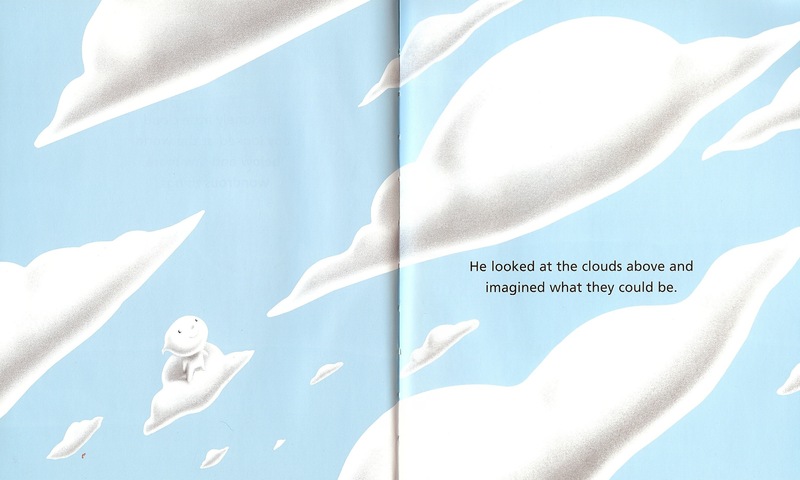 At its most basic level, the book encourages a child to take an imaginative look at the clouds above. 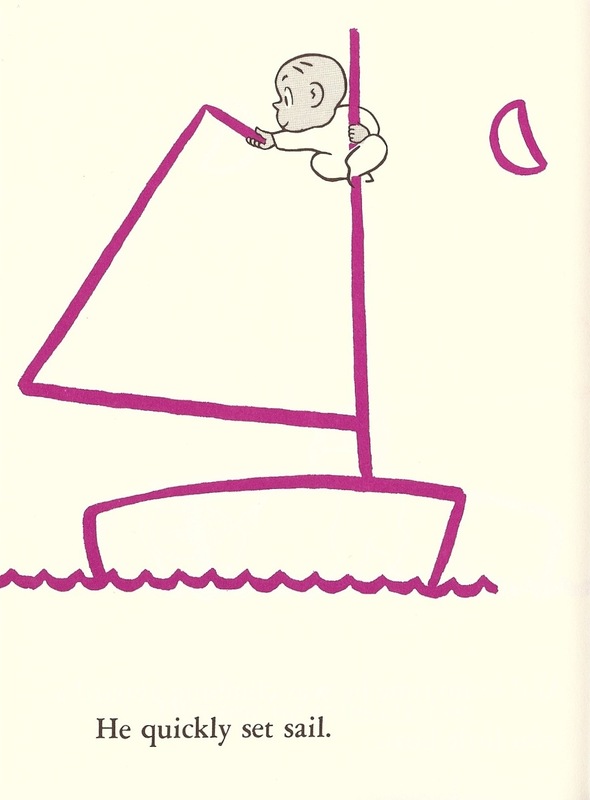 Other picture-book greats have also explored this cherished childhood pastime. Eric Carle used his unique paper-collage style in “Little Cloud,” a book about a cloud that entertains itself by changing its shape to recognizable forms. A 1947 classic by Charles G. Shaw, “It Looked Like Spilt Milk,” is a cloud-based Rorschach test of sorts. But Montijo’s rendition holds its own. His lovely monochromatic color palette and charming protagonist make this book stand out. The succinct text moves quickly enough to hold the attention of even the youngest readers, and the book itself is the perfect petite size to tuck in a bag for an afternoon at the park. 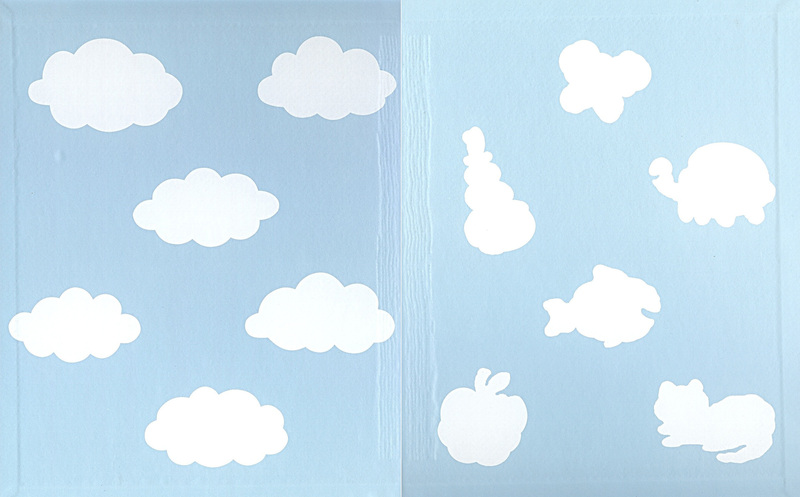 Always a fan of artistry in the endpapers, I adore that Montijo has offered the young reader a cloud-spotting guide of sorts: the front pages display generic puffy clouds but the back pages show those clouds transformed into ducks, birds, fish and the like. Montijo did, in fact, establish a successful career for himself in art. The bulk of his previously work has been in comics, but the tone and look of these cartoons were dark and often violent. 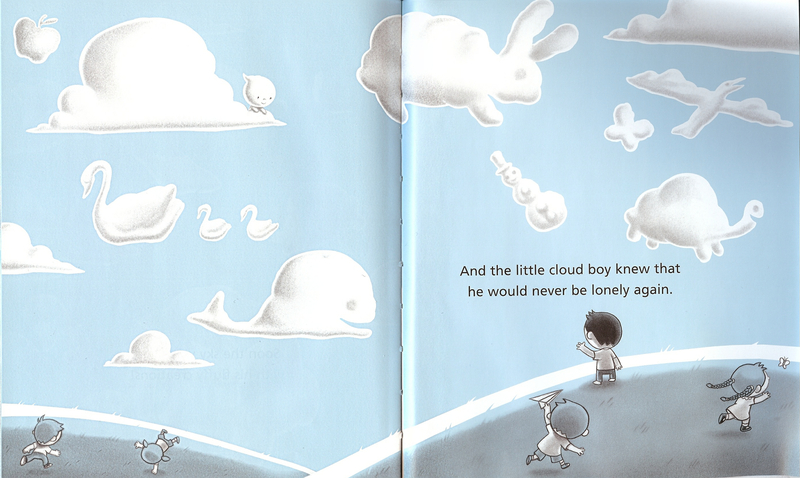 The 2006 publication of “Cloud Boy” marked Montijo’s debut in children’s literature and a drastic lightening of the subject and aesthetic of his work. Following the success of “Cloud Boy,” Simon & Schuster also published Montijo’s “The Halloween Kid” in August of 2010. Keeping with his distinctive use of color (this time appropriate shades of orange, black and white), the book employs cowboy-esque language to follow the adventures of a boy determined to save Halloween from TP-crazy mummies, pumpkin-sucking vampires and goodie goblins. I typically steer clear of holiday-themed books (the stories are usually bland), but I’ll be adding this one to my girls’ treat bags this fall.